Looking for an easy classroom project? Great Valentine's Gift for Mom's and Dad's. For best results print out picture first and lay the craft sticks on top. Glue two crafts as shown in picture. Paint as desired. Let dry. Attach ribbon on back with craft glue. Print out picture first and lay the jumbo sticks on top. Mark where you need to glue the sticks. Acrylic Paint or Ceramcoat works best. Ceramcoat is washable when wet and will dry permanent so use a smock or old t-shirt. 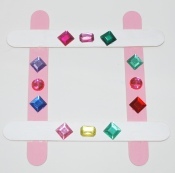 Paint wooden shapes and attach with craft glue. Decorate with glitter glue to add sparkle and write name with a paint pen.